Technology has allowed me to make amazing friends from around the world, improve education for children, and have a rewarding career. But we need margin in our lives. We need time that is not committed. Note: This is another cross-post from my other blog - "Eric the Rad" - where I share some thoughts on life from a nerd's point of view. This one deals with finding balance between technology, work, and life. As educators this is a critical issue for so many of us, so I felt it would be valuable to share here as well. Back when I was in high school I was the editor for our school yearbook. I learned loads of publishing skills including developing photos in a dark room (with actual chemicals, as this was way before anything digital), writing corny captions, and designing creative layouts. 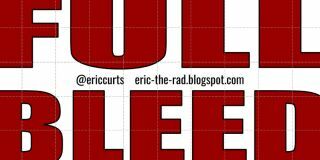 As part of making layouts, I learned the term "full bleed". This is when you take a photo, or some text, or any design element and run it right up to, or even over, the edge of the page. Normally you would have a margin around each page, but with full bleed you have a picture that breaks out of the traditional constraints and extends off the edge. Far too often in my life I have been existing in a state of full bleed. Filling every square inch of my time, pushing myself to the edge, living without margins. Fully bleeding myself out. For me one of the greatest reasons for this is technology. Now don't get me wrong, I love technology and it can certainly be a force for good, as it has often been in my life. Technology has allowed me to make amazing friends from around the world, improve education for children, and have a rewarding career. There will always be another email to read or write. There is always one more blog post or website or YouTube video to explore. The Twitter stream is actually an unending river. Facebook has no bottom. You can scroll and scroll and scroll and scroll forever and you will never reach the end. And it is all very justifiable. Retweeting a great resource from an edtech friend. Staying up until 1 AM writing a new blog post on a creative way to use a Google tool. Working late to record a webinar to teach others. Squeezing in time to stay up to date on the latest and greatest tech tools through podcasts or Facebook groups or RSS feeds. Unfortunately our culture rewards full bleed. We wear bags under our eyes like a badge of honor, and take pride in how few hours of sleep we can get by on. But we need margin in our lives. We need time that is not committed. Margin is there for our safety. Think of the guardrail along the side of a twisting mountain road. It provides a space between you and a hundred foot plummet. There is no actual danger at the guardrail. The danger is another six feet away. The margin is there for when, not if, there is an accident, so there will be room to swerve and adjust and recover. In the same way, life will go wrong. Maybe an unexpected illness, or loss of a job, or end of a marriage, or passing of a loved one. We need margin in our lives to see the warning signs, to have time to make changes, to avoid making things even worse. But margins are not just about avoiding the bad. Margins are where real life can happen. In a book we use the margins to jot down notes about what we have learned, how we have been inspired, and what we want to explore. The same can be true in life. Life happens in the margins. Life happens when we take the time to have a meal with a friend. Life happens when we turn off our phone and look someone in the eyes and actually listen to what they are saying. Life happens when we walk away from the computer and take a walk through the woods. Life happens when we intentionally choose to do nothing. To give ourselves the gift of no agenda. To stop. To be present. To play. To simply live in the moment. To see the wonders all around us that are so easy to miss. I don't share these thoughts as someone who has this figured out. I share this as the guilty party. Far too often I have lived in full bleed, with no margin in my life. But I am trying to change. You may have noticed my production of technology resources has slowed quite a bit. I have not blogged as frequently or made as many videos or shared as many tweets. I am still doing these things, but not as much. I am trying to find margin. I have been catching up with old friends. I have been playing with my grandson. I have been questing in World of Warcraft with my daughter and son-in-law. I have been weeding and painting and cleaning. I have been reading books and going for walks and listening to music. And I encourage you to do the same. When you work, work well. But know when to stop, to play, to live.